Change via external options screen (located in the installation folder). Go to DirectX tab and make sure that Disable a passthru to real DirectX is not checked. Now go to MS folder in dgVoodoo's folder and copy files D3DImm.dll and DDraw.dll. Go to the <path-to-game>\WINO and paste the files in there. 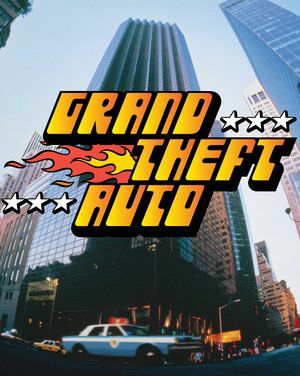 Error message: "Error 296.473: Cannot find the default display mode"
Download Grand Theft Auto I Launcher. 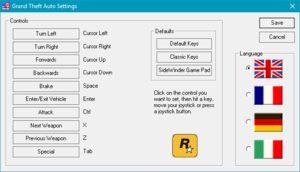 Extract GTA I Launcher.exe from GTA I Launcher.zip and copy it to <path-to-game>. 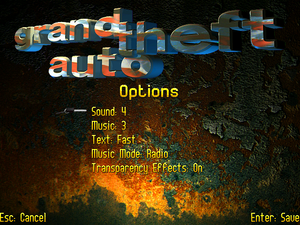 Run GTA I Launcher.exe to start the game. The audio tracks of the Steam version are named wrong which leads to hearing police radio chatter when not in a car. 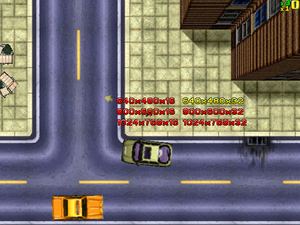 Extract GTAFixer.rar and copy to <path-to-game>. Go to this post on GTAForums and download the updated mss32.dll provided by user Alienx999. Paste it to <path-to-game>\WINO\ and overwrite the existing file. ↑ 2.0 2.1 File/folder structure within this directory reflects the path(s) listed for Windows and/or Steam game data (use Wine regedit to access Windows registry paths). Games with Steam Cloud support may store data in ~/.steam/steam/userdata/<user-id>/12170/ in addition to or instead of this directory. The app ID (12170) may differ in some cases. Treat backslashes as forward slashes. See the glossary page for details. This page was last edited on 24 April 2019, at 02:19.